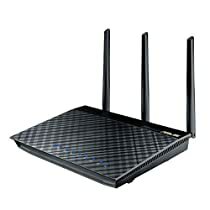 The ASUS RT-AC66U Gigabit wireless dual-band router offers users Broadcom’s 5th generation Wi-Fi (5G WiFi). Its 2.4GHz/5GHz bands drive data rates of 1.75Gbps, or three times 802.11n speeds. ASUS AiRadar technology amplifies transmissions for optimized signals, helping expand networks. The RT-AC66U uses ASUSWRT setup, QoS standards, multiple SSIDs, and twin USB ports, turning it into a multi-role device with file, DLNA, and printer server capabilities with 3 x detachable R-SMA type antenna, >50% wider coverage than standard N SPEC, VPN Server function enable and IPv6 support ASUS RT-AC66U is a true Business class router yet affordable from regular consumers. ASUS AiCloud service: Access, stream, share, sync - all on the go with unlimited storage expansion! Warning: This is a long rant. If you don't like reading about people complaining, please disregard. TLDR: Customer service is absolutely terrible and I will not bother with another Asus product. Main concern is in the third paragraph. When I first bought this in September of 2014, I was amazed and satisfied with the performance this router delivered, especially after coming from a $40 Belkin router that lasted around 4 years. Setting up wired printing with the available USB in the back of the router was somewhat straightforward and required adding a port in Windows. The router delivered great speeds and was super simple to set up. The web ui was adequate, but required some navigating to get to the settings that I needed such as activating QoS (which I was never really sure worked). My positive experience ends there. I made sure to do my research so that I would get a reliable machine. I retired the Belkin router because I would need to unplug and plug the power cord back in due to heavily reduced speeds after a while of using it. Now, something similar is happening to this Asus router about half a year later (where the Belkin took almost 4 years to do). The Asus router would require weekly power cycles to normalize the performance. Me and my family were okay with that since it was only a once-a-week thing we had to do to get our internet speeds back. A year later from my date of purchase, this router started to really go downhill in terms of performance and reliability. Wireless internet would severely lag while the wired connection retained normal performance. This would occur frequently and predictably when multiple users tried to start an online game such as Black Ops 3, League of Legends, etc. A power cycle would return the performance needed for adequate game play at the cost of a couple minutes to reconnect to the match. Starting a download at moderate speeds will completely knock the wireless internet down while the wired connection still worked fine. This also required a restart to fix. With that said, the aforementioned complaints are not the reason for the 1-star review. This Asus router has 2-year warranty so I thought to go through with taking to customer service since sometimes we get a bad unit. The following customer service experience has everything to do with the 1-star. As a preface, there is no damage to the router, it has not moved since the date of purchase, and is exposed to ambient air to prevent overheating. I contacted Asus' customer service online in January 21, 2016 about the issues I was having. We went through the usual troubleshooting with trying different firmware versions, hard resets, and basically everything that they instructed me to do. This stretched well into February with my issues still occurring. Why am I putting this much work into a $140 unit that is suppose to just work? I got fed up and asked them for a RMA. I provided them with the model number, serial number, and other information for a RMA. The representative said another email will be sent with the forms for the RMA. Two things happened here. First, I did not receive said forms and waited about a month. Second, I assumed (wrongly) that I would be receiving a replacement unit while my old router was sent in for the RMA (which is why I waited for a month for the RMA). I made this assumption since internet usage is a big deal in my household of 5 people. Everyone uses the internet heavily for video streaming, gaming, working, and the occasional downloads. So I thought it would make sense for a replacement unit for me to receive before I sent out mine to prevent outages in my internet service. Asus thinks differently. They want me to send in my unit for a standard RMA which takes 5-7 business days. Then maybe send me a replacement unit or fix my unit and send it back which takes even longer. I don't know about everyone else, but I pay a little over $100 a month for internet service. For Asus to go through this process would mean I waste over $50 dollars (assuming it takes two weeks) in unused internet service. I was not having this and respectfully asked them to send me a replacement unit first. They declined saying it is against company policy to send a replacement prior to receiving the troubled unit. I complained that I would be wasting money in unused internet. Customer rep said they were sorry and would escalate the issue higher in the chain. The next rep, literally word-for-word, said the same thing as the previous customer rep which prompted me to write this review and leave my impressions. Asus customer service doesn't have the time of the day to provide me with a proper response. Instead, I received a generic response that was copied from the other rep from just a few days prior. As a kicker, both reps insisted I go through with the standard RMA, yet they still haven't sent me any forms whatsoever to do so. I realize it is against company policy to do as I ask and that the service reps at the level I spoke at cannot do much about it. I simply believe it is unfair and unreasonable that for this process to go through, I would have to waste 2 weeks worth of internet service for a rather pricey router that was suppose to just... work. Ultimately, it was the second representative's copy/pasted response that really ticked me off. I refuse to do business with Asus again. Makes a high frequency buzz/hiss/whine when downloading! Router works great, don't get me wrong. However, it creates a loud buzzing/hiss noise whenever I'm downloading something on WiFi. It's a high frequency and quite loud. My wife and I could here it from 20 feet away over a movie that was playing. Returned the first one hoping it was a fluke. Second one had the exact same problem out of the box! All I had to do to replicate the problem was run a speed test from my phone. Router made that high frequency buzz/ hiss (coil whine?) only when testing download speed. Very disappointed. Could have lived with it if the router wasn't in the living room, but come on, something that costs more than $100 shouldn't do this. Why should i have to hide an expensive electronic piece of hardware such as a wireless router? 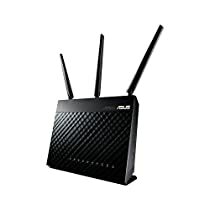 Going to try the new Asus rt-ac68a once it's released here on Amazon for nearly the same price, but with better performance. I've had the router for 9 months now and have no issues with stability, connectivity, etc.. Using both 2.4 and 5GHz networks with no issues. But after 9 months the router is having problems trying to keep the connectivity between my cable modem and itself. I needed to do a firmware update, so I did that and so far it's been good. I will update the review in a couple weeks to see how the firmware update works. Update, since a couple firmware upgrades, this router is getting better and better - now it has a smart phone app I can use to manage it, awesome! Update - 1 year and 7 months of ownership - RMA'd device to ASUS and now the router is stable and is in great shape. Added an additional star because the RMA was free and I didn't have to pay for shipping either. Appreciate ASUS' dedication to supporting their products. This will also be the last time I update this review as with any RMA I still needed a way to have Wireless, so I jumped to a professional grade router and wireless access point. That way I can replace the router and/or access point or add them as needed versus depending on one machine to do it all.